With the sunshine beaming outside, your dog is dreaming of his time in the yard and you’re stressing about how you will keep her safe all summer long. Spring is the perfect time to consider and prepare for your containment options, and you will find an in-ground or wireless fence is one of the best choices. PetSafe Containment Systems can make the warmer weather more relaxing and stress-free by keeping your pet in your yard. In-Ground Fence™ and Wireless Pet Containment System products options are almost 15 times cheaper than the average cost of a traditional fence. Plus, they don’t block off your view from the rest of the world. You can keep your furry friend safe in your yard, but there are so many choices. How will you ever decide? Don’t worry – we’re here to help and we’ve compiled a quick list to help you find just the right system for you. Best of all, it should take you under five minutes to choose. When planning for a PetSafe Containment System, there are three factors you should consider. 1. What is the size and shape of the area you want to contain? The Stay + Play Wireless Fence® creates a circular boundary up to 3/4 of an acre and is often the best choice for smaller yards. With In-Ground Fence systems like the Deluxe In-Ground Fence you can customize the shape of the containment size up to 1/3 of an acre. Either coverage area can be expanded. With the Stay + Play Wireless Fence or original Wireless Pet Containment System, you just have to purchase an additional transmitter. In-Ground Fence Systems can be expanded with the purchase of additional wire and flags. Your coverage can grow up to 10 or 25 acres depending on which fence you choose. So, before you purchase consider what system works best for your yard’s size and shape. 2. How much time do you have for installation? 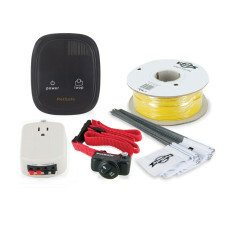 You can easily set up a wireless system in an hour or two. You will need to find a central location for your transmitter near a power outlet. You can either mount the transmitter or set it on a flat, dry surface. After you plug it in, adjust the size of the size of the boundaries, charge the Receiver Collar, and test the system. An In-Ground Fence System is more of a day project. You will first mount the transmitter and lay out the wire where you plan to create your boundaries. Test the system and then bury the wire. 3. What Correction Level do your pets need? Regardless of the system, you can add as many pets as you need. 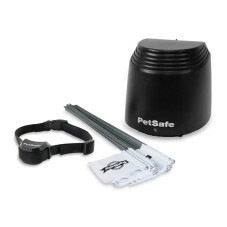 Each containment system comes with one unique collar specific to that system. 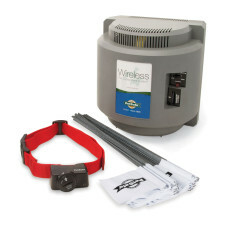 The Wireless Pet Containment System Products and Stay + Play Wireless Fence System have collars with five levels of static correction and a tone-only mode. The Basic In-Ground Fence system’s collar has one level of static correction, while the deluxe series come with four levels of static correction catered to the type of pet that will be using the collar. Both the Deluxe Little Dog and the Deluxe Cat Receiver Collars are designed to fit smaller pets. The Stubborn Dog Receiver Collar features four levels of manually adjustable correction and a tone plus vibration mode. By considering these three things, you should be able to find the perfect containment system for you and your pet. Let us know if you have any questions, and remember – regardless of the system you choose, training time will be required for your pet! Plan to spend 10 to 15 minutes a few times a day working with your pet. With all of our systems, you will receive a step-by-step training guide to make it easy and fun. What containment system will you choose? If you already have one, what is your favorite feature? Let us know in the comment section below! ABOUT NATALIE As the PetSafe Brand Marketing Specialist, Natalie manages The Paw Print blog and generates other brand related content including public relations and promotions. Before PetSafe, Natalie worked in the local media covering politics, education, and religion. She is a substitute pet owner to a German shorthaired pointer named Bedford in Abingdon, VA, Frenchy the schnoodle in Lenoir City, TN, and all the office dogs at PetSafe brand headquarters in Knoxville. As a pet lover, she is currently searching for the perfect puppy to join her home. Training Tool Choices: The Harness or The Head Collar?